These are some of the services and home repairs that I provide. For a more detailed list click on "All Services". If you don't see what you need listed, give us a call (864) 634-4192 We service Anderson, SC and much of the Upstate. High utility bills? Make your home as energy efficient as possible and save money! Install lights & ceiling fans, mount TV's, repair drywall, install closet organizers...let a pro handle it for you. Pressure wash, deck renovation, mulch, screen repair, lighting, trim shrubs...I got you covered! Install storm doors, hang curtains & blinds, replace locks, replace shutters... We even wash windows! Install or replace a sink or garbage disposal. Leaky faucet, slow drain...I'll fix it. I also sharpen knives. Install bath fans. Leaky or running toilet...I'll fix it. Deep clean your tub or shower...we can do that also. Assemble just about anything...furniture, grills, play equipment, etc... I also do minor welding. Attics, garages, basements, backyards...I can clean up and haul away. Selling your home? Let us makeover your home and property to sell quickly and for the most money! Are you looking for a reliable and professional handyman in Anderson, SC? If so, you have come to the right place. I take pride in my work and I'd love to help make your home beautiful and stress free. I'm different from most handymen. When you work with me, you will not only get high quality service and attention to detail, but you will also get great communication. When I schedule a job, I'll be on time. Let me take care of your home so that you can spend time on the important things like spending quality time with your family. How I'll save you money! As a BPI certified building analyst, I have been in thousands of homes helping people save money by learning how to make their homes energy efficient. 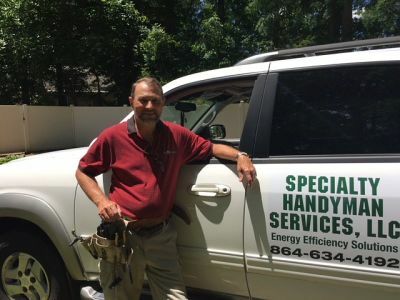 When you hire me, you will get more than just a handyman, but an energy expert that will be able to point out many ways to shave money off your monthly energy bill. How I'll save you time! Stop stressing about those irritating "TO DOs" around your home! You already have too many things on your plate. Let your specialty handyman do them for you so that you can relax- knowing that your home is always in its best condition- exactly the way you want it. Your neighbors will have no idea how you do it all! Handyman for Anderson, SC and much of the Upstate.